Wonderful book, scholarly introduction to the neglected English tradition of spiced food which stretches back to the time of the Crusades. This is easy and excellent. I have been making it for decades. Have not used wild mushrooms but regular white ones are just fine. Ingredient list is wrong. This is an excellent dish. There is a similarity to tandoori foods in the spice mix but the result is completely different. A similar recipe is in Italian Food. Better with fresh than dried fennel stalks. Try using unsmoked SE US country ham. Needs a proper braising pot. Takes about 2 h to cook though the recipe says a shorter time. P. 192. Take care not to overcook as I did with 4# chicken. Agree w/Chriscooks note about needing a more prominent-tasting ham and fresh fennel being better than dried. Did not use my Le Crueset pot (it's so dad-burned heavy...); perhaps this was reason enough for it being overdone. Simply the best green tomato chutney recipe ever. I add the vinegar all at once and it doesn't make any difference. Been making it for years and have not yet come across a better recipe. 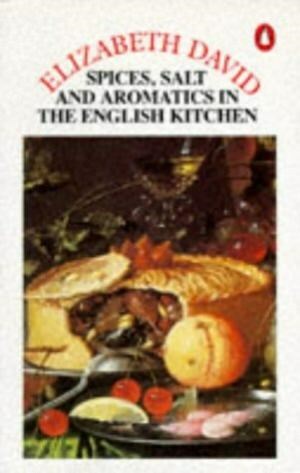 Elizabeth David presents a collection of English recipes using spices, salt and aromatics. The book includes dishes such as briskets and spiced beef, smoked fish, cured pork and sweet fruit pickles. An emphasis is placed on the influence of the Orient on the English kitchen.